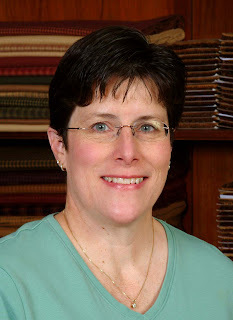 The Fat Quarter Shop is excited to welcome Lynne Hagmeier of Kansas Troubles Quilters to the Jolly Jabber. Today she is here to touch base on Flannel Days, her newest collection with Moda. What could be more inviting than a soft, cuddly quilt made entirely from brushed cotton flannels in warm, rich prints? Our Flannel Days collection has a wonderful assortment of florals, leafy prints and geometrics in classic KT tones of deep red, green, navy, black, gold and tans that blend together beautifully - not too feminine or too masculine. When I opened the box of strikeoffs, I was immediately struck by the luscious softness of the fabric - it's like petting a kitten. It's perfect for lap quilts to tailgate at your favorite sporting event or curl up in front of a fire on frosty evenings. It's also a cozy choice for a bed quilt on chilly fall nights. When asked how I get my inspiration for a fabric line, my answer is pretty simple: I create fabrics that I would purchase to make a quilt for myself - and I do! What a job!